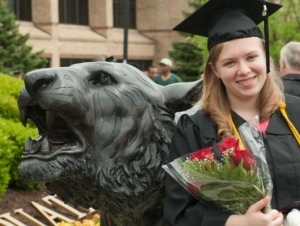 Buffalo State College President Katherine Conway-Turner announced plans Monday for a new completion initiative, Roar in 4, which guarantees to incoming full-time freshmen that they will be able to take the courses they need to complete a bachelor’s degree within four years. 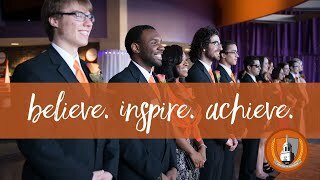 If a major course is not available during a students’ fourth year of attendance—and the student has met all aspects of the Roar in 4 pledge—Buffalo State will cover tuition of the course the following academic year, or make accommodations to complete the course in the fourth year through independent study, course by contract, or substitution with a comparable course as determined by the major department. "We know that less than half of adult New Yorkers currently hold a college degree, and that by 2020, nearly 70 percent of the jobs in our state will require one," said SUNY Chancellor Nancy L. Zimpher. "As SUNY works toward a completion agenda of 150,000 degrees per year, 'Roar in 4' is precisely the kind of evidence-based program that will help us achieve that goal for our students and for our state. Congratulations to President Conway-Turner and the entire SUNY Buffalo State community on the launch of this promising completion initiative." Successfully complete 15-18 credits each semester (fall and spring). Enroll in summer sessions or J-term if enrollment falls below 15 credits during a fall or spring semester. Take an appropriate mix of Intellectual Foundations (general education), major, and elective courses every semester until requirements are fulfilled. Monitor degree progress through Degree Works. Accept responsibility for course selection of sections and timely registration through Banner. Apply for graduation by the stated deadline. Work with academic adviser to determine if graduation in four years is still the best path. Utilize available academic support services on campus. Meet regularly with professors to discuss performance in courses. Pay tuition, fees, and orientation charges. Clear any holds. Provide tools that allow students to monitor their degree programs. Offer general education and major required courses regularly. Provide academic advisers for students. Accept appropriate AP & IB scores and prior college credit, obtained while students were in high school, from another post-secondary. Publish major and graduation requirements in the College Catalog. Notify students of upcoming registration dates and times. If a major required course is not available during a student’s fourth year of study, and all requirements have been met, students, after consultation with an adviser, are to submit a written request for accommodation to the chair of the major department if an independent study, course by contract, or course substitution is deemed necessary. Written requests for tuition waiver if options are not viable will be made to the Provost through the major department prior to the beginning of classes of the last term of the students' four year plan. Additional information about the Roar in 4 program is available online.